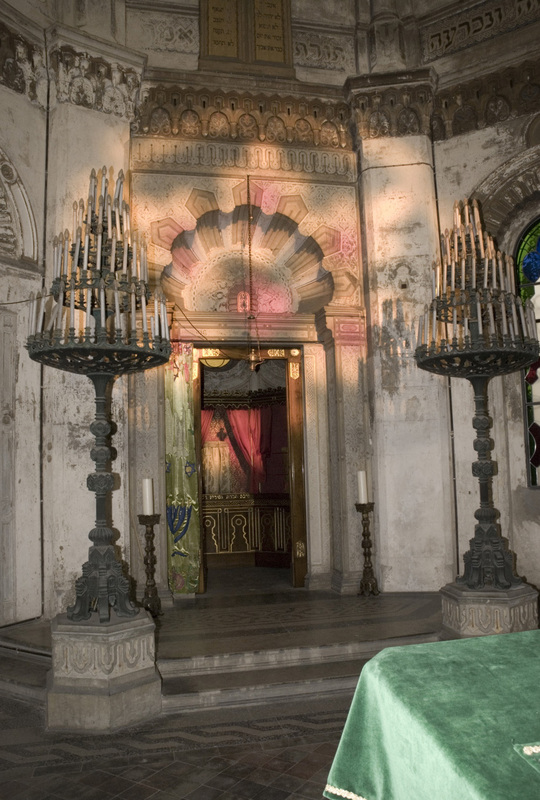 The purpose of the research being presented through this website is to provide a comprehensive and up-to-date inventory of the historic synagogues of Europe. In so doing, we have used the following definitions to guide our approach. 'Historic synagogues' are defined as all pre-World War Two structures and important post-War synagogues. The countries of Europe covered by the research are in accordance with the 47 Member States of the Council of Europe with the addition of Belarus. The Community category describes the particular 'denominational' strands of Judaism that have been linked to the synagogue. belonging to a particular historical period or artistic trend - for example Gothic, Baroque, Art Deco. We deploy the terminology commonly used in the country concerned, as well as corresponding style names used across Europe. This may be reflected throughout the building or in particular architectural elements. possessing artistic decoration - for example sculpture, stucco decoration, stained glass windows, and wall paintings. Works of artistic craftship are important in their own right and impact on the significance of the entire building. belonging to a larger historical compound - for example Jewish quarter, Jewish street, or so-called shulhoyf (a compound of several synagogues and Jewish communal buildings). belonging to a larger townscape - for example skyline, city square or street. witnessing a particular historical event or belonging to a particular historical period. reflected in folk legends or other forms of collective memory. related to a person of public interest. being the only, or one of a few, examples of a notable building type. Integral to applying these criteria to each synagogue is the dimension of public understanding and appreciation. The significance assessments have been carried out by heritage experts and applied to each synagogue according to a 1-4 rating system explained below. A building was constructed or served as a synagogue, and has no distinct architectural features or they are not preserved. It arouses interest only at the local level. A building is a preserved example of regional synagogue architecture. It arouses interest only at the local and regional level. The building is an important example of synagogue architecture in a given country. It is an object of national interest. The building is of outstanding architectural, urban or historical importance. It has unique features and/or is especially influential internationally as an architectural pattern. The significance of a synagogue is put in jeopardy if it is not properly maintained. Permanent use of a building supports its preservation and reduces the possibility of deterioration. Conversely, abandoned buildings are automatically considered at risk. The technical condition of a building reflects the level of care and maintenance it receives. Risk assessments have been carried out by heritage experts and applied to each synagogue following an A-E rating system explained below. Rankings of C & D define a synagogue at risk.